We're taking a blog detour today in honor of therapy pets who though some of the simplest of ways are making a big impact on the lives people in need of a friendly purr or a furry friend. Hero pets are present during our most difficult human moments – war, illness, disaster, and loneliness. Sometimes it's the simplest gestures that make the biggest difference in somebody's day. Even a soft purr can comfort a wounded or lonely heart. This month, the Petco Foundation is honoring these "Helping Heroes" and the organizations that support these animals, many of which are adopted from shelters and rescues. We'd like to introduce you to three very special hero pets – three therapy cats that are making a difference in the lives of people from all walks of life. We first got to know Basil and her therapy partner, Tina Parkhurst, through Facebook. Seeing their photos and reading their heartwarming stories and experiences never fails to bring sunshine to our day. But the sunshine we experience from afar pales in comparison to the warmth they spread through their therapy visits. Basil and Tina serve seniors mostly. Each week they visit three local facilities in their Portland, Oregon area. Once a month, they also visit one corporate office. It's the seniors that touch Tina's heart the most though. "So many of the seniors we visit have nobody to come see them, or if they do, it isn't very often." She loves seeing their faces light up when they see Basil. "Their feeling of love and gratitude is so sincere and warm, it helps me get through the week." We can only imagine how hard it is for seniors living in a nursing home or assisted living environment where they no longer have the companionship and love of the pets they once had. 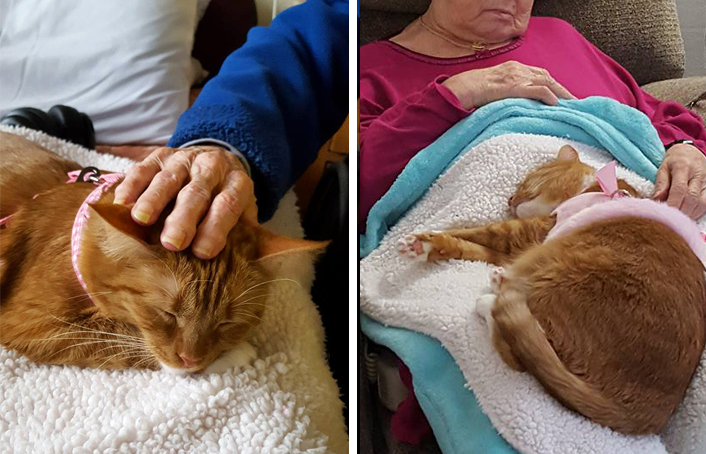 Being able to sleep peacefully with a kitty curled up on your lap once again is something many residents probably thought they'd never be able to experience again. Tina gives all the credit to Basil. "Basil makes it all possible. When a human walks in alone, some part of us wonders what they want. Basil has no ulterior motives and people know it, so they open up instantly." One day in our Facebook feed we read a post that Tina wrote. It really touched us. She said she felt as though Basil had given her life purpose. That adopting her was somehow meant to be. There's no question that Basil is a very special kitty. And Tina is a very special human. Basil and Tina are affiliated with Pet Partners. 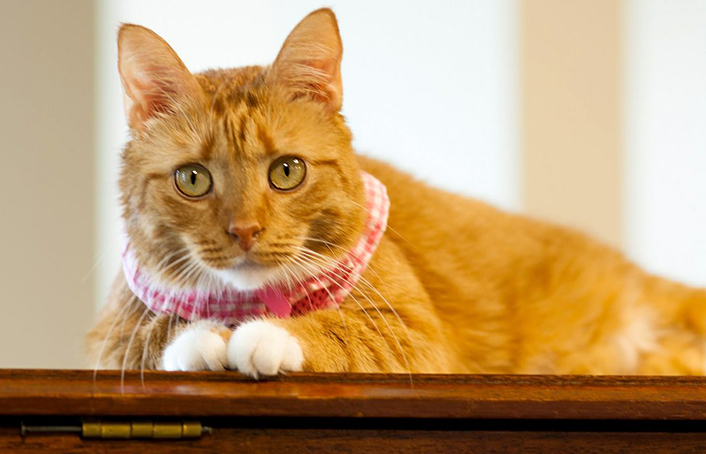 If you are lover of cat blogs, you'll certainly recognize Summer, from the award-winning SparkleCat.com. 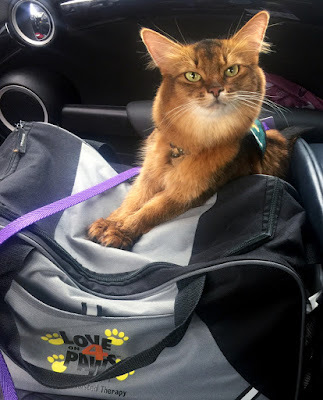 Every day on her blog, Summer shares her adventures as a therapy cat and offers up both hilarious and very sound advice to cats and the people who love them. Summer's therapy partner is Janiss Garza, an accomplished publisher, writer and editor. They regularly visit two Los Angeles area hospitals. Most of the patients in one of the hospitals are bed-ridden and many are middle-aged or elderly. The second is a mixture of adults and children. Janiss' big surprise has been how amazing Summer is with children. Especially given she has no children or young relatives of her own. "She's very, very patient with them, even when they are touching her awkwardly." When visiting the bed-ridden patients, Janiss will lay a sheet over them and let Summer join them if they'd like. "She immediately snuggles up to the patient, does healing purrs and makes happy paws. I did not teach her to do that. It's something she came up with on her own." Janiss has heard from other therapy teams and organizations that somehow therapy animals just know what to do. "I guess it's a sign that they were meant for this work." Summer and Janiss also visit a pair of homes for boys who are either in trouble with the law or have somehow wound up in the court system. Summer has some pretty fun tricks up her furry sleeves for these visits. "At our most recent visit, she gave one of the boys a high five for a piece of fried chicken and he was blown away!" They have also visited college campuses like USC and Cal State Los Angeles. 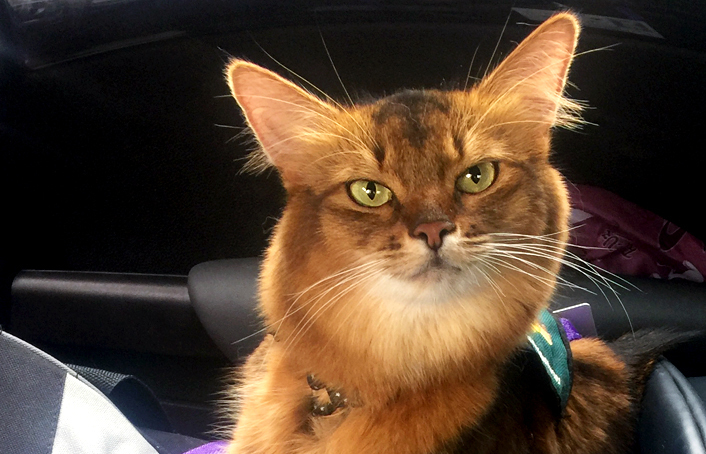 Though many people associate therapy animals with dogs, Summer proved that cats are where it's at. One of the students working on the USC therapy pet program told Janiss just this week that when Summer visited last year, she drew 100 more students than with just the dogs, and they stayed longer! Summer and Janiss are affiliated with Love On 4 Paws. 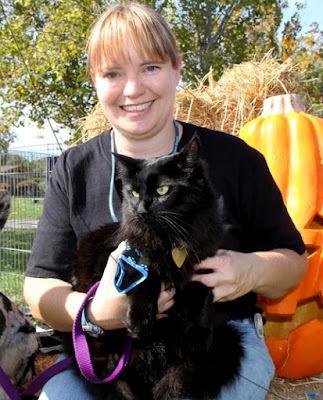 Patty Guthrie, had worked with both therapy cats and dogs. From the very beginning, she was amazed at how gentle her furry, black Mokey was with people. So she began by training him with a harness and leash, taking him places and helping him get used to all sizes of dogs and people of all ages. Now Mokie is nine-years-old and with Patty by his side, regularly visits foster homes, convalescent homes, high schools, colleges and libraries, and the Ronald McDonald House. He travels in the comfort of a cozy cat stroller and often hops out to cuddle with the people he visits. When he visits libraries, children often engage by reading to him. It sure looks like Mokey is an awesome listener. “I used to be scared of black cats, but he is adorable,” said an 11-year-old girl in a thank you note. She appeared frightened of Mokey at first, but within 20 minutes was holding him in her lap. Mokey listened to her read a story at the library. Mokey and Patty have made more than 350 therapy visits over the past nine years. "Mokey is my best pal and my dearest friend." They are affiliated with Love on a Leash and Furry Friends Pet Assisted Therapy Services. The Petco Foundation has already invested more than $10 million to support these organizations and hopes to raise $2.5 million more to support service, therapy, and working animals by sharing stories of some of these amazing heroes and raising awareness about the impact they have on our lives. You can help make a difference too, by donating online or at your local Petco store October 7 through October 29, 2017. To learn more about the Foundation and the Helping Heros campaign, visit their website here. Such special kitties and such special humans. Oh that poor person who missed cats. Choked me up terribly. Therapy cats are the best!!! 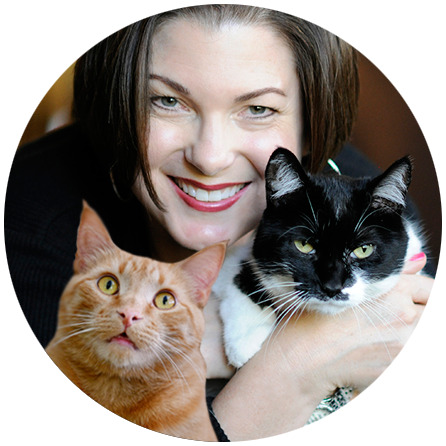 I'm so excited and honored to be profiled with these two other REALLY awesome therapy cats! Although I've never met them in person, I have met Basil's human, and my human knows Mokie's human from a private Facebook group of therapy cat teams. I hope more people become aware of therapy cats - and request them! Nobody knows therapy cats are wanted unless people ask! Very special kitties and humans!!! 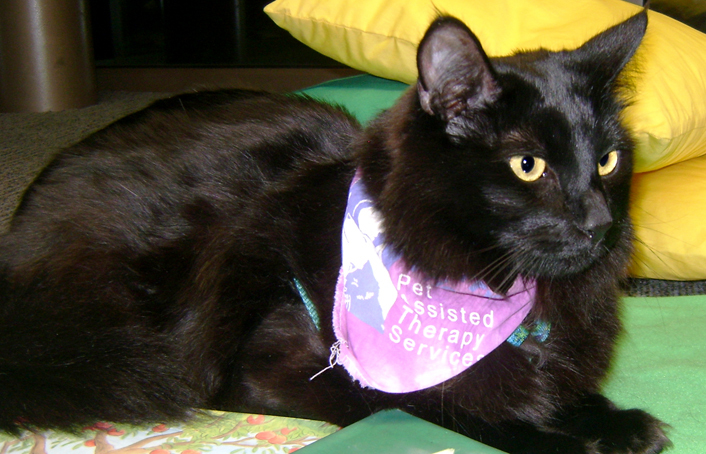 Wonderful how the magic of therapy pets can help those who need purrs the most! Congratulations to Tina and Basil, Janiss and Summer, and Patty and Mokie!! Great post! I enjoyed every word and picture and I am grateful there are even more therapy cats! Thank you for the article. 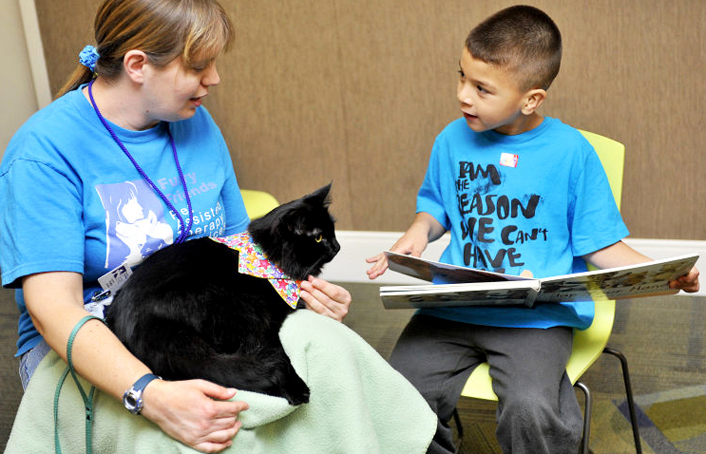 We've always been so impressed with therapy cats. These 3 are amazing at what they do. amazing cats and their people - and so glad to see a foundation supporting the efforts of therapy groups helping to get pets visiting people that need them. We love each of those special therapy teams and we really enjoyed this special post! Thank you for sharing the stories of these three therapy cats! I hope that I can be visited by a therapy cat if ever I find myself in a hospital or assisted living situation, I know it would change everything for me. These kitties and their humans who bring them to people of all ages and needs are an inspiration. I'm also happy to know that Petco supports this cause! What wonderful cats and generous people! Recently my Mom spent two months at a Hospice facility in CT and there were many lovable therapy dogs who came to comfort patients and families. No cats though...we really could have used some cats! Nice to read about this special trio. How wonderfully special these kitties and their humans are! I love Summer! Nice to meet these other amazing kitties too. Three cheers for the three wonderful therapy cats. Me, I'm too shy with peoples other than mum. So I don't think I would be good at it, but more power to those who can do this stuff. I did meet a sweet therapy dog once. He was a black labradoodle with the sweetest face and even sweeter attitude. I asked one of my doctors if our hospital had any therapy cats, and he agreed (as a pet of a cat himself) that they really should. Ever been to HCME when you lived here? What a great post! Of course we know Summer, and it was great to get to know Basil and Mokey. Therapy animals do so much good for people and it's wonderful these cats are spreading the word. Love this post. All the animals are wonderful, however we are in love with Basil! Compliments to Tina for her work and the loving photography!